Those aren't burnt spots, their sweet dried cranberries. Yumm! Since I didn’t really do anything special with the corned beef and cabbage, I felt the need to make the homemade Irish soda bread with a twist. But really, the truth is… I just don’t like following recipes. Perhaps it is a need to make my life more difficult than it needs to be, or maybe it is just that cooking and baking is a creative outlet for me. 😉 Yep, that’s it. I’m not as confident in my baking skills as I am in my cooking, probably because baking is more of a science. As such, I typically start a baking adventure by finding an inspiration recipe to go off of and then make it my own if possible. This recipe is inspired by the recipe for Irish Soda Bread by Barefoot Contessa, I just love her. I can’t resist orange and cranberry flavors balanced with a little nuttiness. 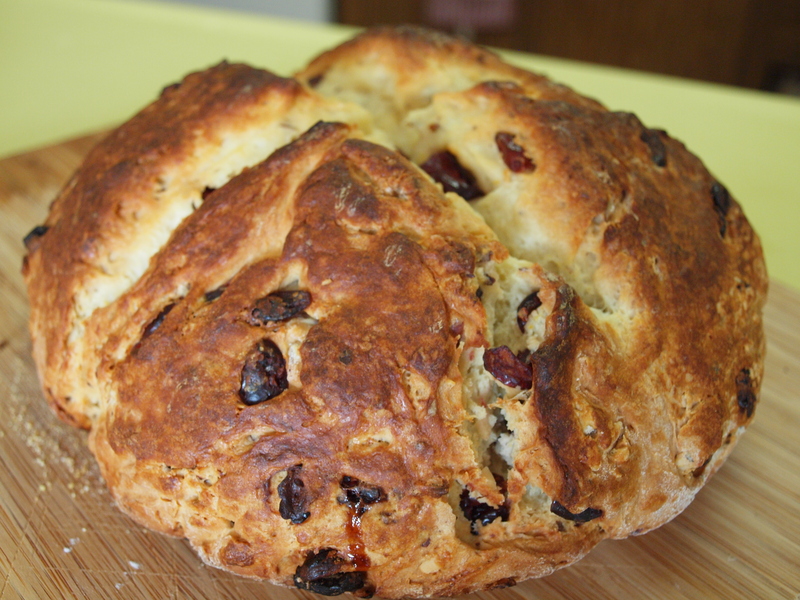 Below is my recipe for Cranberry Orange Hazelnut Irish Soda Bread. Preheat the oven to 375 degrees F. Sprinkle a pie pan with cornmeal . Combine the flour, sugar, baking soda, and salt in the bowl of an electric mixer fitted with the paddle attachment. Add the butter and mix on low speed until the butter is mixed into the flour. With a fork, lightly beat the buttermilk, egg, and orange zest together in a measuring cup. With the mixer on low speed, slowly add the buttermilk mixture to the flour mixture. Combine the dried cranberries with 2 teaspoons of flour and mix into the dough. Add the chopped hazelnuts and mix. The dough will be very sticky. Dump the dough onto a well-floured board and knead it a few times into a round loaf. Place the loaf on the prepared pie pan and lightly cut an X into the top of the bread with a serrated knife. Combine the melted butter and warmed buttermilk. Brush the top of the loaf with the melted butter mixture. Continue to brush the mixture on the dough throughout baking process (every 15 minutes or so). Bake for 45 to 55 minutes; keep an eye on the loaf and after it becomes golden brown cover with aluminum foil for rest of baking time. Loaf is done when a toothpick is inserted and comes out clean. Cool on a baking rack. Serve warm or at room temperature. Leave me a comment and let me know how you life it! Posted in Affordable Eats, Baking, Palate Pleasers and tagged Barefoot Contessa, Bread, bread recipe, butter, buttermilk, Celtic music, corned beef and cabbage, corned beef cabbage, Cranberry Orange Hazelnut Soda Bread, Cranberry Orange Soda Bread, dried cranberries, flour, food, hazelnuts, homemade Irish soda bread, homemade soda bread, Irish, Irish bread recipe, Irish Soda Bread, Irish Soda Bread recipe, Measuring cup, orange zest, recipe for irish soda bread, Saint Patricks Day, Saint Patricks Day food, Saint Patricks Day recipes, Soda bread, soda bread recipe, St. Patricks day. Bookmark the permalink.